There’s something strangely timeless about Days of Heaven, even though it is firmly set in the year 1916 when the wheels of industry were turning America into a brave new world, full of hope and promise. Maybe it’s the naturalistic style of acting and the dreamy way the camera follows the characters about, as if observing humanity on its endless journey across the earth. Or perhaps it’s the forces of nature, captured in all their dramatic splendour, that trigger the senses to plug straight into the heart of the emotional landscape. Whatever it is, this film is cited by the likes of Kurosawa, Coppola and Scorsese as one of the best ever made. The story is simple; Bill (Gere) and his ‘sister’ Abby (Adams) flee Chicago with their little buddy Linda (Manz) and find work on a sprawling Texan farm. The owner (Shepard) takes a shine to Abby and a curious love triangle begins to take form, all keenly observed by the philosophical Linda whose rough, smoky voice provides an authentic commentary to the action. Her verdict is that people all have ‘half devil, half angel’ in them. It’s trying to strike the balance that’s the hard part. 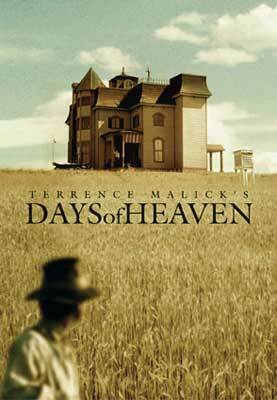 This was Malick’s second film after the brilliant Badlands and with it he scored the Best Director award at Cannes. His cinematographer Nestor Almendros bagged an Oscar for his stunning work which captures everything from the beauty of the windswept wheat fields to the horror of them going up in flames. Most of the film was shot in that fleeting moment when the sky bursts into colour like an opal and the world is transformed into a place where characters too, however small, become myth-like. Couple this with a haunting score by Ennio Moricone and the magical mood is inescapable. It would be twenty years before Malick directed another film, and even then, this would be hard to beat.